French Christmas stars (étoiles de Noël) are a specialty from the north eastern part of France (the Alsace region in particular) but is enjoyed throughout France. You can also find these in the Marchés de Noël (Christmas Markets) that flourish in cities and villages all over France in December. 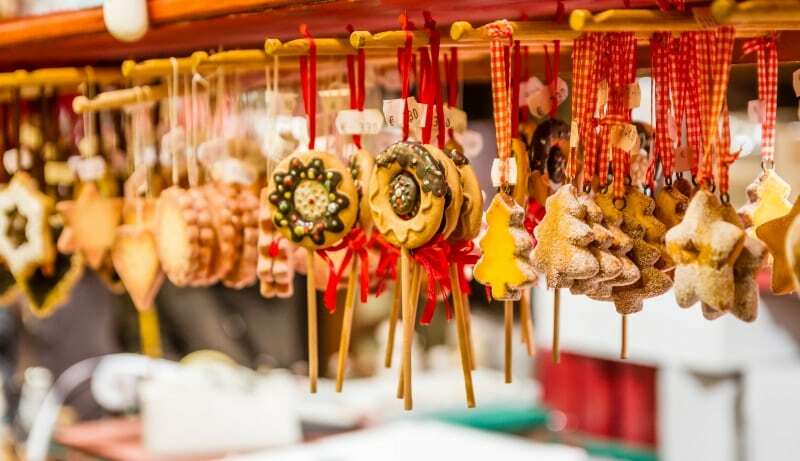 A Marché de Noël is typically an outdoor market where you can taste traditional regional Christmas food, purchase Christmas crafts and decorations from local artisans and where you get to enjoy your étoile de Noël with Christmas music – lovely way to get into the holiday spirit! 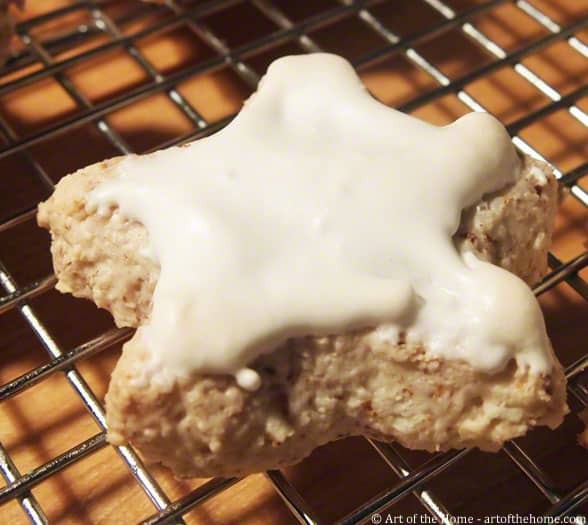 You can bake these delicious and light star shaped French holiday cookies in about 15 minutes – not too bad and cheaper that a trip to France! French Christmas stars are perfect with tea, coffee, hot chocolate, hot cider and even vin chaud (hot spiced wine) – another specialty you can enjoy in France’s Marché de Noël to keep you warm while you shop! To make these beautiful treats at home, you only need 2 ingredients but lots of it so we recommend getting your almonds at a local wholesale store (Cosco or Sam’s Club) where they sell almonds in bulk (500 grams bags). Great savings, especially if like us, you make several batches throughout the holidays. This is not the type of recipe where you need to use fine almonds from a gourmet store. So check below for the Art of the home detailed French Christmas stars recipe and Art of the Home suggestions. A very nice touch for the holidays, these French Christmas stars only take 15 minutes to bake (about the same time to prepare) and as long as you use our tip on how to roll the dough, it is very easy to make and fun. Baking these snow white holiday Christmas stars is a delicious way to get into the holiday spirit. Enjoy and bon appétit! Take your eggs out of the fridge at least 30 minutes before starting. And if you forget, the first you should do before getting started is separating your whites and leaving them on the counter as long as you can. Store egg yolks in the fridge for another recipe (check Art of the Home suggestions below for ideas). Sift your confectioners’ sugar. 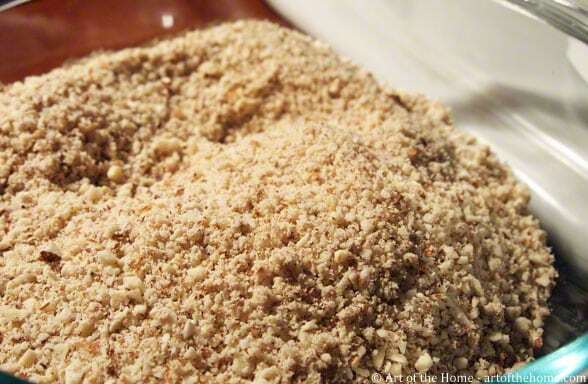 Check Art of the Home tip on how to sift without a sifter. 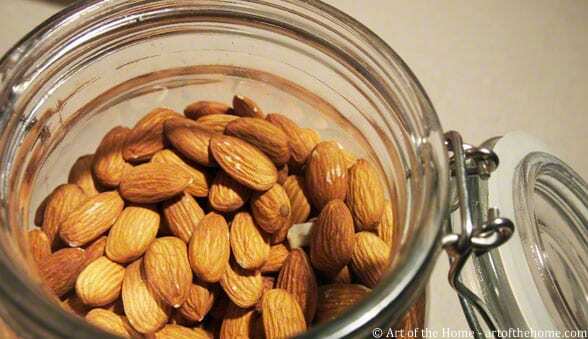 Grind your almonds very finely and set aside. 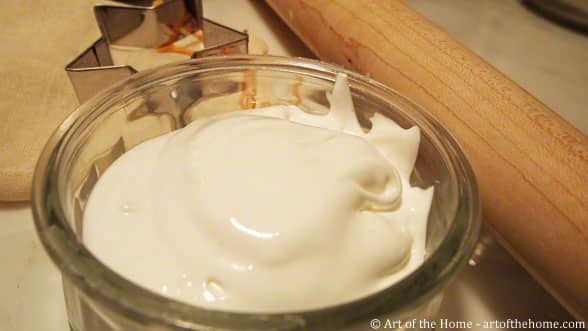 Add a pinch of salt in your egg whites and whisk to obtain very firm beaten egg whites. Then whisk in sifted confectioners’ sugar — one big spoon at a time (any soup spoon will do). When you are done with the confectioners’ sugar, the mixture should be firm and glossy. During the process, scrap the sides a couple of times with a rubber spatula. And voilà, you just made your royal icing. Reserve about 4 heaped soup spoons (cuillère à soupe) of royal icing for decoration your stars later. Note: you can also do your royal icing separately from the dough for the stars but we prefer to bake a few less stars and have less dishes to clean! Preheat oven to 350 °F. Mix in the ground almonds with the royal icing (with flat beater if using KitchenAid). 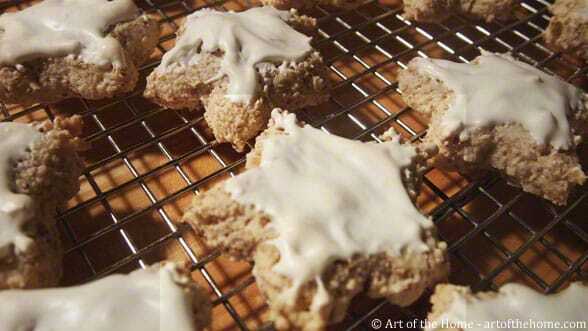 Place almond/sugar dough on top of a large piece of aluminum foil or parchment paper. Put a large sheet of parchment paper on top and start rolling and flattening the dough to a rough rectangle about 1/2 inch thick. Note: save your top parchment paper, you can reuse it for the second batch. Using parchment paper under your rolling pin is a great tip for this recipe because the dough is very sticky and you will be grateful you don’t have to remove dry bits of dried up almond dough on your rolling pin afterward – that’s no fun! 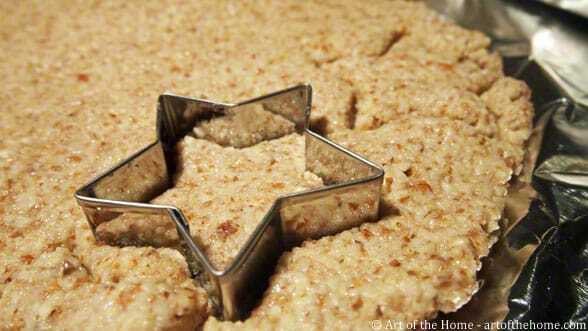 Using a star cut out, make your stars and line on a cookie sheet using your reusable Silpat or parchment paper. You should have 4 rows of 7 stars and some leftover for another batch. You can also do two batches at once. Bake for 10 minutes. 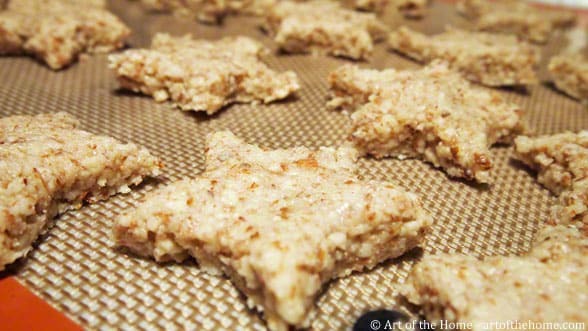 After 10 minutes, remove cookie sheet from the oven and spread the royal icing on each star. We like a more rustic look so we simply use an espresso spoon and our finger! For each star, we use about 1/2 of an espresso spoon (equivalent to about 1/4 heaped tsp) and spread it with a finger. If you want a more polish look you can use an icing bag which will give a more precise look. 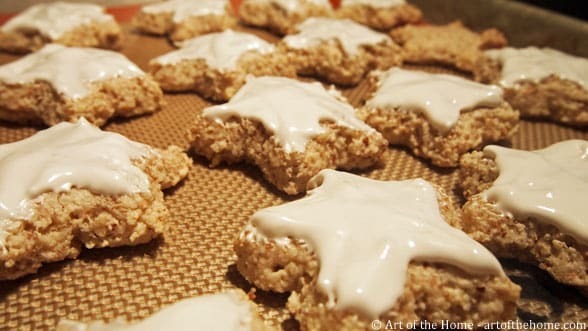 Once you’re done decorating your stars, return to the oven for another 5-7 minutes but monitor closely because the goal is to have snow white stars not tanned stars! Take out of the oven and place on cooling racks after a couple minutes. Spiced French Christmas Stars: you can add various spices if you would like – cinnamon, all spices, vanilla, etc. What to do with your egg yolks? Put them in the fridge and you can make a nice and hearty Pasta Carbonara à la Française for dinner the following day – simply cut all the other ingredients’ quantity in half. Sticky dough: if your dough is too sticky, it probably needs more ground almonds. But keep in mind, this dough is always sticky — you should be able to barely lift the star cut out but it will not be as easy as when you use cookie dough, French Christmas stars dough is much stickier. If needed, use your dough scraper to lift the stars.